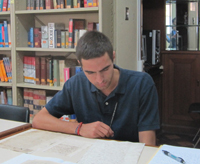 “Altamirano’s anecdotes of miracles, demons, and biblical allusions give his history its own distinct coloring, while revealing ideologies that underlined his Church’s and society’s work,” says VanderZee, who was invited to present his findings at the Final Colloquium of the Glynn Family Honors Program in late April, as well as the University’s Undergraduate Scholars Conference in May. Under the guidance of Rev. Theodore Hesburgh Professor of Arts and Letters Sabine MacCormack, VanderZee pored over every relevant document he could find—from accounting books to personal letters. 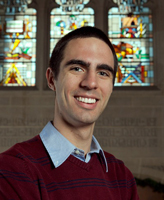 First, VanderZee says, he plans to spend two years teaching high school social studies in Texas as part of the Alliance for Catholic Education’s Service Through Teaching program.